A death-chest mod for Minecraft. This mod requires that you install Minecraft Forge version 1.8-11.14.0.1252 or later. After you have successfully installed Forge, simply place the file lootable-bodies-#.#.jar in your mods folder. You can get the lootable-bodies-#.#.jar file from the Releases tab of this repository page. Q: Why can't I have player skins on corpses in Minecraft 1.7.10? A: Grabbing player skins on demand is a new feature in Minecraft 1.8. I don't have the time nor the interest in reimplementing Minecraft 1.8 in Minecraft 1.7.10. Q: Please can you add player skins to the 1.7.10 backport? Q: I found a bug in the 1.7.10 backport version. Will you fix it? A: Possibly, Work on the latest MC version is however my priority. Q: I found a bug in the 1.8 version. Will you fix it? A: Yes. Please post the full crash report and a description of how to reliably create the crash on the issues section of the github page. Q: Can I use this mod in my public mod pack? A: Yes you can. You do not need my written permission. Q: What happens if my corpse falls into the void? A: It's gone for good. can you add realistic physics to it, please cus i do like this mod but I'm kinda getting sick of the corpse being in one pose only. Two, The discord invite is expired. Something cool u could do is make it so mobs also drop their bodies! I'm using Minecraft version 1.12.2 and each time I die I'm unable to respawn. I typed /kill, and then the "Respawn" button just wouldn't do anything except mess up the rendering in the background when I clicked it. Also, my skin is an Alex variant (slim arms), and I notice that the skin has those odd black bars on the backs of the arms, and the body is not posed like the pictures showed. Just wanted to take a moment to say thanks for putting in the additional work and effort. I stopped by the project page and learned that you are working on a rewrite. I look forward to being able to use this mod again on a new more recent version. Thanks again, keep up the awesome work! 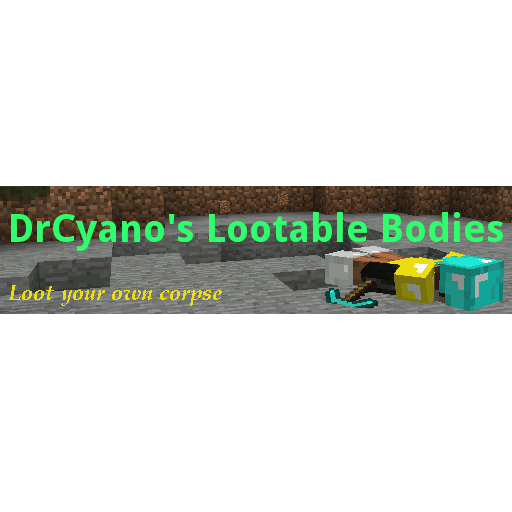 does the lootable bodies and graves from openblocks interfere with each other? has anyone tested it? If you had read the description you would know this answer. "Q: What happens if my corpse falls into the void? A: It's gone for good." Any idea when this mod will be compatible with 1.11? When it is and not before, don't ask for updates, they wont happen any faster. I know what it feels like to be asked the same question over & over (somewhat akin to having a child asking pestering "why" questions). Along that same vein, I am fully aware of what it feels like to be eager for an update on a mod I really love. That said, thank you for this great mod; I've enjoyed it a great deal. How do you get rid of the corpse? Edit: Turns out you just empty the inventory and use a shovel on the corpse. I'm having an issue with corpses not rendering properly. What makes this unique to all the other death chest mods out there. Can you update the description with more info and/or a video?